Farmingdale, NY - A small plane ended up on a Long Island road after running off a runway Saturday, leaving the aircraft damaged but no one injured, authorities said. After taking off from Republic Airport in Farmingdale, pilot Nedie Seidu flew about 40 miles east and tried to land at the small Lufker Airport in East Moriches around 12:30 p.m., the Suffolk County Police Department said. But Seidu wasn’t able to stop before rolling off the runway onto Montauk Highway, authorities said. 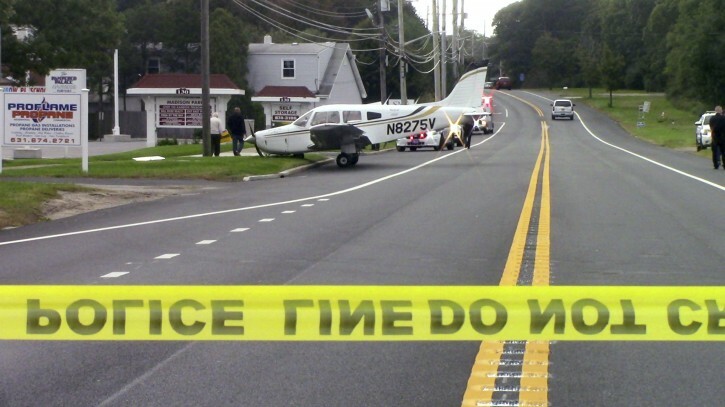 The single-engine Piper PA-28 crossed the two-lane road and hit a sign, damaging the plane’s propeller and a wing before it came to rest in front of a commercial strip, police said. No contact information for Seidu, 30, of Manhattan, could immediately be found. The pilot was bringing the plane in for maintenance at a repair show at Lufker Airport, which has a 2,300-foot-long (701-meter-long) grass runway, said manager Ron DeLalio. “He just overshot the field, came in a little too hot,” said DeLalio, who wasn’t acquainted with the pilot. The Federal Aviation Administration said there was a second person aboard. That person’s name wasn’t immediately released. Federal Aviation Administration records show the plane is owned by a Delaware company with the same name as a Farmingdale flight school and airplane rental company. A man who answered its phone declined to comment and hung up. The FAA is investigating the mishap.